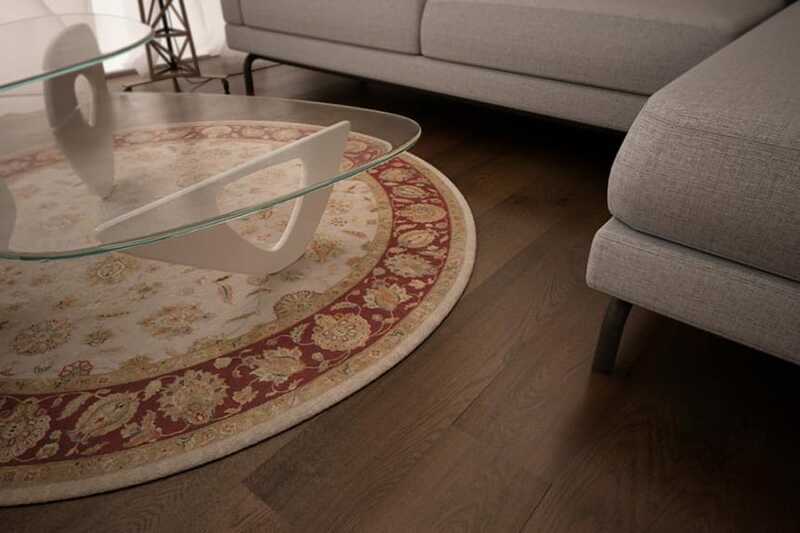 Engineered wood flooring is a highly versatile, stylish and durable flooring option. Available in pretty much every grade, colour and finish you would expect from solid wood, engineered wood flooring is a man-made product, made from natural ingredients. An amalgamation of plywood, topped with a solid oak lamella or top layer, engineered wood flooring, unlike solid wood flooring, can be installed successfully over under floor heating. What’s more, because engineered wood flooring doesn’t expand and contract to the same extent as solid wood, it lends itself perfectly to any areas of the home where moisture and, or temperature fluctuations might be anticipated. 180mm, or just over 7 inch wide engineered wood flooring is today a highly sought after flooring solution. In contrast to recent decades, when floorboards tended to be narrow, fashion has reverted back to the wider boards of many, many years ago. Typically, if you look at photographs of very old houses, you’ll see that floorboards were very wide and then became narrower when machines were introduced into the floorboard manufacturing process. Because the width of your engineered wood flooring can be purely based on choice (there is no restriction from an effectiveness point of view), there is no reason why you can’t opt for a nice wide, 180mm, or just over 7 inch wide engineered wood flooring solution for your project.